Meal kit services are an option for busy households that want hassle-free dinners, but which deliver on cost, convenience and taste? We trialled seven to find if any were worth forking out for. "I’m very grateful for your detailed advice, which gave me confidence ... Thanks again for the staunch support." "I feel I have already benefited greatly by joining recently. Having read the Consumer articles, I rang and spoke to George in your technical department. Most helpful and I have now chosen my home ventilation system – such a relief!" "Today we visited The Warehouse and, following your advice, purchased a heater. The icing on the cake was its price, $49! Thanks as usual for all the good advice." Is palm oil in your hot cross bun? If you’re a paying member, our expert advisers can explain your rights and help resolve the issue. We explain what your rights are under the Consumer Guarantees Act, and what to do if they’ve been breached. 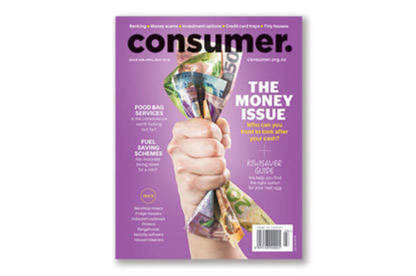 Our April/May magazine is the money issue. Plus more reports, product tests and all your favourite regular features. See more of what’s in our latest issue. Consumer has been testing products for more than 50 years. Now we’re testing businesses as well. We keep an eye on products being recalled and keep a list of them so you know what to do if you're affected. We’re campaigning to end expiry dates on gift cards, prevent unwanted door-to-door salespeople, stop unfair contract terms and more. Learn more about these campaigns and get involved. Our investigation finds many renters are getting a raw deal. But property managers deserve a bigger share of the blame for problems. Could you be saving on power? Consumer Powerswitch lets you check if you could save money on electricity and gas. Just enter your details into the calculator to find the cheapest energy deals. Find out if you're on the cheapest broadband plan with our new website, Consumer Broadband Compare. Using it is as easy as entering your address. See if you can save.